PureTest is an easy-to-use GUI-based functional test tool, ideal for testing, debugging, and automation of tests for ip server applications. Test cases are built through the GUI with no programming needed. PureTest has built-in support to automate the execution of test cases within different frameworks. PureTest is hardware and OS independent. PureTest simulate clients on a protocol level. A mix of supported protocols can be used to build realistic scenarios. PureTest is designed to be independent of the technology used on the server side. PureTest is a function test tool for internet applications with free distribution. PureTest is ideal for testing, debugging, and automation of test cases for server applications. 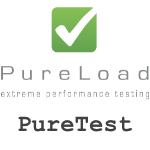 Test cases made in PureTest can be re-used to build performance test scenarios in PureLoad. PureTest has built in support for automating test cases. Test can be automated in numerous ways, for example; Using IDEs such as Eclipse, doing continuous integration with Jenkins/Hudson, or using unit test frameworks like Slingshot. PureTest runs on UNIX/LINUX, Windows, or MAC OS platforms. Can be deployed in virtualized environments. Mix protocol usage to create realistic user scenarios. Open API for creating own protocol support/extensions. Includes a HTTP Recorder and HTTP Crawler for recording mobile and web-application behavior. PureTest support the following protocols: IPv4 and IPv6, HTTP/HTTPS, Asynchronous HTTP, Web Sockets, Telnet, SSH, FTP, Network Utility (echo, Ping, DNS etc. ), Directory Server (LDAP), Database (JDBC), Mail (IMAP, POP3, SMTP). PureTest Pro also support HTTP/2, HTTP Adaptive Bitrate Streaming (HLS, HSS, HDS, MPEG-DASH), RTP/RTSP/RTMP Streaming, Diameter, Radius, SIP, GTP, TCP/UDP. Platform Independent - Hardware and OS independent. Runs on any platform that supports Java version 1.8 or higher. Supported OS - Windows, Mac OS X and Linux/UNIX. Web Server Technologies - PureLoad is designed to be independent of the web server. This is achieved by working on a protocol level and simulating the traffic generated between the client and the server. Supports: JavaEE, ASP, .NET/C#, PHP,Ruby, AJAX, SOAP, Apache and Apache Tomcat, Windows IIS, NGINX, Oracle Weblogic. PureTest Pro has all the functionality of PureTest but PureTest Pro gives you access to all of the available protocol extensions. These extensions include support for Streaming, VoIP, etc. PureTest – comes with a personal license and free distribution. Both PureTest editions come with the same functional support. PureTest is limited to run one (1) test case with one (1) virtual user at any time. PureTest Pro - has all the functionality of PureTest but PureTest Pro gives you access to all of our protocol extensions. The extensions include support for Radius, Diameter, RTSP/RTP Streaming, HTTP Adaptive Streaming, SIP, etc. PureTest is verified on Linux, Mac OS X and Windows operating systems. Java Standard Edition 8 (Java SE 8) from Oracle is required. Installers with bundled Java is provided and recommended on Windows. At least 30 MByte free disk space is required for PureTest and additional space for Java (if not already installed). PureTest is distributed in a self-extracting format. Simply execute the installer and answer the questions about install location, etc. in the graphical user interface provided. For details on how to execute the installer on different operating systems, see instructions in the mail that included the license. When you purchase PureTest (or request a free license) you will receive a license file that reflects your specific license options. The license is a text file that must be installed in the <install-home>/license directory. The name of the file must be puretest.license. Note: The current license information can be viewed from within the PureTest GUI using the "About->License Info..." menu choice. The steps to uninstall PureTest depends on the platform being used, but you will find an application in the <install-home> directory named PureTest Uninstaller. Start the application and you will be guided through the uninstall process. The following sections briefly covers important PureTest concepts that you need to understand before trying to start and use PureTest. A test case in PureTest is structured as Scenarios. A scenario is defined by a series of tasks or sequences of tasks and is the unit that are executed by workers (load servers). A task is the smallest form of operation in PureTest and normally consist of a client request (for example a HTTP request), but can also be a utility task to check a previous result or extract information from a previous result. When you have one (or several) test scenarios you probably want to automate and run the saved PLC file using the PureTest Runner.